The Coyote volleyball team has made this a season to remember. They have gone undefeated so far this season, with a 24-0 record and a home winning streak of 55 games. The Coyotes recently clinched their sixth straight CCAA title, their ninth in the last 11 years. The team clinched the title with their 3-0 win over No. 23, Sonoma State. The clinch only tells half the story of the remarkable season the Coyotes have had thus far. The girls have yet to lose a single game, having won 24 consecutive games. “Not the goal! We just want to win every time,” said Coach Cherniss when asked about the undefeated season. Associate head coach, Danny Scott agreed. “Having an undefeated season is not the goal. The goal is to win a championship,” said Scott. Having an undefeated record does not affect her more experienced players. “It’s easier for the less experienced players to get caught up in the hype, but it has no barring on tomorrow,” said Cherniss. If the Coyotes continue their streak, it will be a historic undefeated season. If they have felt the pressure, they surely haven’t shown it. Cherniss is doing something right in leading her team to some amazing results. She said she encourages her team to believe they can do anything. The idea of success has also been instilled in the team. “We have an expectation of success,” said Cherniss. For the first time since 2008, the Coyotes find themselves in the top spot of the conference. They were ranked No. 1 by the American Volleyball Coaches Association (AVCA). The Coyotes even beat their own CCAA hitting percentage record which they set in 2008. The team raised the bar from .506 to .523 percent. The season has witnessed many one-sided victories courtesy of the Coyotes. Sonoma State, Chico State, Humboldt State, CSU Stanislaus, CSU LA, CSU Dominguez Hills, and CSU East Bay are among the teams that fell to the Coyotes in three sets. Nothing seems to phase this team. In September, the Coyotes faced three teams in four days and did not falter. The team has been strong throughout the season and the results show. 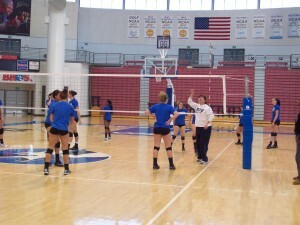 The team is full of star players, from good liberos, consistent setters and aggressive hitters. Senior Samantha Middleborn has been recognized four times this season as the CCAA’s Volleyball player of the week. In 2010, Middleborn was named AVCA and Daktronics Player of the Year and has an incredible list of honors. “Middleborn’s a goddess. She’s 6’2” and has a reach of 10’,” said Cherniss. The Coyotes can lose the next three home games and still earn the title, but that’s not what Cherniss wants. “We want to win. We want to beat our opponents,” said Cherniss. NCAA II West Regional begins Nov. 17, and the National Championship begins the first of December.